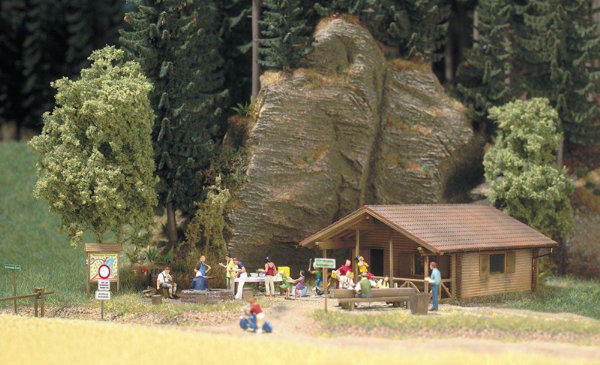 Kit for a super-detailed log cabin made of light »pine wood« modeled on the Black Forest. The door and windows can be opened or closed. The gutter is "correctly" coppered. The walls have a fine wood structure (also on the inside). Inside is a large, open fireplace. Supplied complete with wooden tables, wooden benches and cut-out bows for various purposes such as forest hut, kiosk, etc. Size: 111 x 92 mm, 50 mm high.